Permeare’s answer to tartaric stabilization and to reducing pH in wines and musts is Permastab, our plant based on resins’ exchange. It’s very compact and fully automatic and guarantees a fast and extremely secure treatment for wines and musts. The treatment leads to an increase of total acidity in proportion to a decrease in potassium concentration and, increasing total acidity, a decrease in pH ’till pH 2. 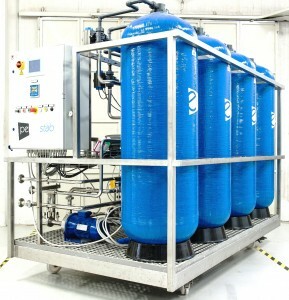 The series Permastab offers a new type of varied sizes, from the smallest ones for treatments of few volumes ’till medium-large sizes which are controlled by a PLC that manages the water softening section as well as the neutralization section for the discharges deriving from regeneration. All types of Permastab can work in continuous and discontinuous way. For small sizes, semi-automatic series, only a little manual intervention is expected for production start/end and for regeneration cycle as well, but equipped with a PLC and an alarm system, always guaranting the safety of the treatment.